This is the perfect gift for alumni or distinguished faculty members! 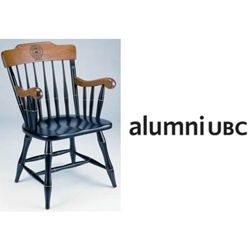 Made entirely of solid maple hardwood, this chair features a steam bent scrolled-top crown in cherry finish with a laser engraved alumniUBC logo, hand-painted gold beading on the spindles, and a comfortable scooped and saddled seat. This is the stupidest thing I've ever seen. It is insulting to students and donors that resources were used to develop this.